A musical revolution is upon us, where 15 or 20 years ago professional recording capabilities were out of the hands of most musicians. Artists had to rely on the well trained hands and ears of sound engineers with big, bulky equipment, but now you can create a polished home studio for the cost of a few professional studio sessions. So, you've built your studio, filled it with Gadgets, instruments and computers... but the sound quality still isn't exactly what you were hoping for. Luckily, there are likely a few simple, inexpensive tweaks you can make to your home studio that will improve the sound and quality of your recordings. You've gone through the trouble of picking out the right microphone model, chosen for the quality your recordings demand, yet it's still producing annoying pops and clicks. A pop shield is designed to filter the odd noises produced by a vocalist's aspirated plosives, as well as keep your microphone free of moisture, bacterial and fungal build up. Pop shields are typically inexpensive, but they can be made from a variety of common materials so it could be the perfect project for the handy musician. Here are some instructions to create your own effective pop shields on a budget. You may already be using professional quality Software for your recording and mixing needs and if so, this message is not for you. For anyone who is still using the free or $20 DAW they found in the app store, it's time to make a change. Yes, they can be expensive for a musician on a budget. Yes, they do come with a learning curve. It's not all bad, though, as there are some excellent and affordable options that give you professional-level tools and libraries to craft polished songs in an easy flow setting. Ableton Live, Logic Pro and Cubase are all reasonably priced for intermediate and pro musicians alike. If you're new to the complex tools these programs offer, try an Ableton Live tutorial to get you started. Power conditioners present an affordable, easy measure to take for multi-functional benefits. It's not often you can get so much for so little, but for less than $100 you can improve your recording sound quality, help organize your electronics and protect your equipment from surges. Small imperfections of sound and frequency can occur in typical AC power lines. All your electronics will alter the sound of recordings on their trip through wires to your recording device. Power conditioners filter the sound to its purist form and improve the longevity of your equipment by always using the optimum amount of electricity. For amateurs and enthusiasts, sound proofing and acoustically treating a room may seem like a micromanaging detail. How much echo could there be in a typical office-sized room? What difference could the floor material make? As you grow into a more professional sound, however, you'll really start hearing the imperfections caused by inefficient or nonexistent acoustic treatment. 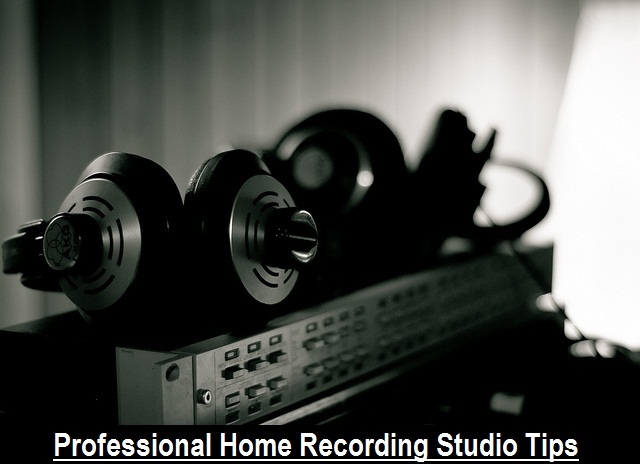 Sound Proofing refers to keeping sound inside the studio. It means minimizing the amount of sound that escapes a recording. Acoustic Treatment means optimizing the quality of sound produced in a studio my minimizing the amount of echo and distortion caused by various factors. Audio Diffusers and Acoustic Panels placed strategically around your room will eliminate a lot of the problems you have with sound bouncing poorly off the walls. Dampening Blankets can be used on a budget to cover large unused equipment which may distort sound, like drum kits or desks. Of course, all the gear and preparation in the world can only go so far. Hard work and a dedication to your craft will help turn these tools into amazing Music to share with the world.